Allotment gardening has been experiencing a huge increase in popularity over the last few years. 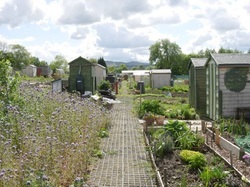 Allotments in Edinburgh are especially popular, perhaps because there are so many flats and houses with little or no garden. There is often a large waiting list to get into the site that you would prefer, but don't let that put you off. An allotment is a long term investment, so apply now, don't wait.